It's that time of year again when the Christmas Advent calendars start to arrive in the stores, and I'm not talking about the chocolate ones, I'm talking about the amazing beauty ones! I've compiled together a few of the ones I've got my eye on and I'll definitely be picking up one of them. 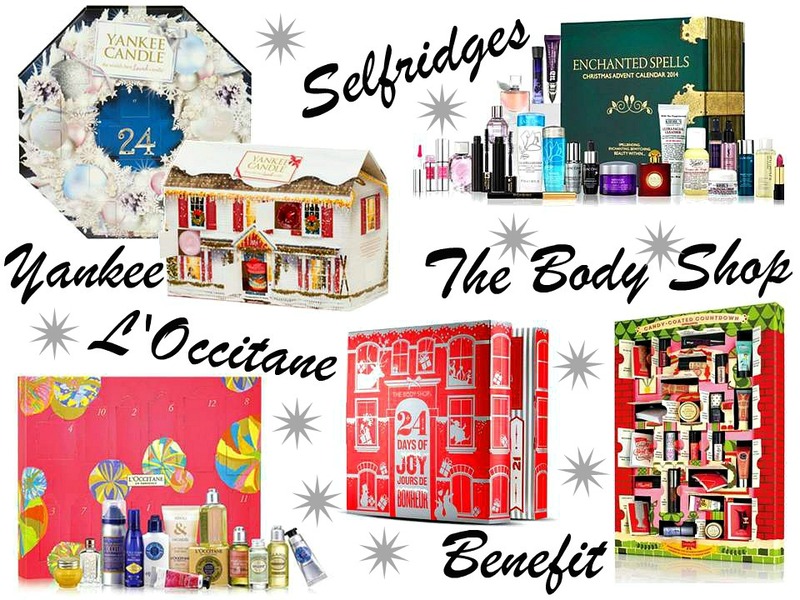 This is definitely the most luxurious of the advent calendars I have listed and the most expensive, coming in at £85; now although that sounds like a lot of money for an advent calendar, the Selfridges Beauty Calendar is guaranteed to be jam-packed with lots of fabulous goodies with the likes Urban Decay, Yves Saint Laurent, Kiehl's, Lancome and many more brands being included. If this is the calendar for you, then I'd recommend grabbing yours now as last years was a sell out. L'Occitane's advent calendar is a little different in the way that it offers 13 gifts rather than the typical 24. Although fewer doors to open, this calendar is still full of wonderful products including fragrance, body care and skincare. The Body Shops Beauty Calendar is full of lots of fantastic beauty treats including bestselling body and face care as well as some of their latest additions making the count down to Christmas that little bit more exciting. Also, with every calendar that is sold, the Body Shop are donating to the charity War Child which helps send children, in conflict areas, to school. After the amazing success of their first beauty calendar last year, Benefit are back again this year with another stocked full of many of their bestselling products including POREfessional, High Beam and They're Real! Not only will you be receiving 18 mini's, you will also receive 6 other goodies including Beauty Sticky Notes and a Doodle Pad. Granted this isn't a beauty advent calendar but I absolutely love Yankee Candles so couldn't not include this. This calendar is jam-packed with Christmas scented tea lights including Cranberry Ice and Christmas Cookie. I love the concept of this calendar because the way I look at it is, each day you will be able to burn a tea light as a mark of the Christmas countdown meaning your home can be full of Christmassy goodness right up until the day itself. This year, Yankee have launched not one but TWO advent calendars! This one is also packed full of Christmassy tea lights but in more fragrances. If you'd like to get your hands on one of these calendars you'd better act fast as they're pretty much guaranteed to be a sell out. Which one do you have your eye on? Or if none of the above which one? I love the Body Shop products so I think I may pick that one up too!